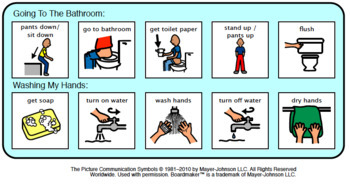 I created these visuals for a student who was having a lot of difficulty using the bathroom independently. 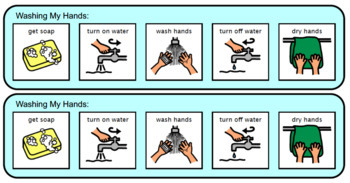 There are 5 steps for using the bathroom and 5 steps for washing hands. I copy this onto cardstock, laminate, and put Velcro on the pieces/main board so my student can visually see what to do next. 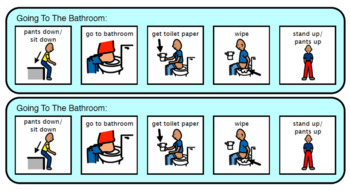 I also created one that she can use at home, so the visuals are the same in hopes that independent toileting occurs more quickly. 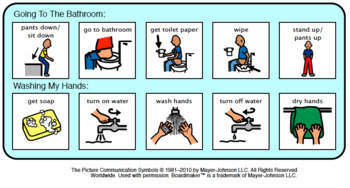 I also created 2 versions of a schedule that's completed that you can post in the bathroom and/or send home (one with wipe and no flush and one with no wipe but flush, depending on your student). There is also a page with 3" x 3" pictures of all of the steps if you wanted to put them on a ring or a larger wall schedule. If you need anything specific created, please let me know! !